Effective Java (second edition), by Joshua Bloch. Despite the wealth of information out there, sometimes it seems to me that many developers still don’t understand the meaning and the implications of Java generics. That’s why I’m trying to summarize the basic information developers need about generics in the simplest possible way. Needless to say, the main advantage of generics is having the compiler keep track of types parameters, perform the type checks and the casting operations: the compiler guarantees that the casts will never fail. Instead of relying on the programmer to keep track of object types and performing casts, which could lead to failures at runtime difficult to debug and solve, the compiler can now help the programmer enforce a greater number of type checks and detect more failures at compile time. Roughly speaking, type variables act as parameters and provide the information the compiler needs to make its checks. Many classes in the Java library, such as the entire Collections Framework, were modified to be generic. The List interface we’ve used in the first code snippet, for example, is now a generic class. In that snippet, box was a reference to a List<Apple> object, an instance of a class implementing the List interface with one type variable: Apple. The type variable is the parameter that the compiler uses when automatically casting the result of the get method to an Apple reference. The method get returns indeed an object of type T, where T is the type variable specified in the List<T> declaration. Pretty much the same way, methods and constructors can be generic if they declare one or more type variables. This method will accept a reference to a List<T> and will return an object of type T.
You can take advantage of generics in both your own classes or the generic Java library classes. Many classes in the library, such as Iterator<T>, have been enhanced and made generic. The iterator() method of the interface List<T> now returns an Iterator<T> that can be readily used without casting the objects it returns via its T next() method. that is even easier to read and maintain. Be aware, however, that boxing and unboxing come with a performance penalty so the usual caveats and warnings apply. FujiApple is a subtype of Fruit. Every Java type will also be subtype of Object. If a reference of an Apple instance can be assigned to a reference of a Fruit, as seen above, then what’s the relation between, let’s say, a List<Apple> and a List<Fruit>? Which one is a subtype of which? More generally, if a type A is a subtype of a type B, how does C<A> and C<B> relate themselves? Surprisingly, the answer is: in no way. In more formal words, the subtyping relation between generic types is invariant. But why? Is an apple is a fruit, a box of apples (a list) is also a box of fruits. In some sense, it is, but types (classes) encapsulate state and operations. What would happen if a box of apples was a box of fruits? If it was, we could add other different subtypes of Fruit into the list and this must be forbidden. The other way round is more intuitive: a box of fruits is not a box of apples, since it may be a box (List) of other kinds (subtypes) of fruits (Fruit), such as Strawberry. The code indeed compiles, but the error will be raised at runtime as an ArrayStoreException. Because of this behavior of arrays, during a store operation, the Java runtime needs to check that the types are compatible. The check, obviously, also adds a performance penalty that you should be aware of. Once more, generics are safer to use and “correct” this type safety weakness of Java arrays. With the advent of generics, this characteristics of arrays is no longer necessary (as we’ll see in the next part of this post) and should indeed by avoided. Let’s suppose, for example, that we’ve got a set of boxes, each one of a different kind of fruit. We’d like to be able to write methods that could accept a any of them. More formally, given a subtype A of a type B, we’d like to find a way to use a reference (or a method parameter) of type C<B> that could accept instances of C<A>.
? extends reintroduces covariant subtyping for generics types: Apple is a subtype of Fruit and List<Apple> is a subtype of List<? extends Fruit>. How Can Wildcards Be Used? Enough theory for now: how can we take advantage of these new constructs? As we saw, this code compiles but results in a runtime exception when trying to add a Strawberry to an Apple array through a reference to a Fruit array. No way. It comes out that, indeed, you can’t put anything into a structure whose type uses the ? extends wildcard. Since we cannot know which supertype it is, we aren’t allowed to add instances of any. What about getting data out of such a type? It turns out that you the only thing you can get out of it will be Object instances: since we cannot know which supertype it is, the compiler can only guarantee that it will be a reference to an Object, since Object is the supertype of any Java type. If you need to do both things, don’t use any wildcard. This is what Maurice Naftalin calls The Get and Put Principle in his Java Generics and Collections and what Joshua Bloch calls The PECS Rule in his Effective Java. Bloch’s mnemonic, PECS, comes from “Producer Extends, Consumer Super” and is probably easier to remember and use. As seen in Part II of this series, in Java (as in many other typed languages), the Substitution principle stands: a subtype can be assigned to a reference of any of its supertypes. This applies during the assignment of whichever reference, that is, even when passing parameters to a function or storing its result. One of the advantages of this principle, then, is that when defining class hierarchies, “general purpose” methods can be written to handle entire sub-hierarchies, regardless of the class of the specific object instances time being handled. 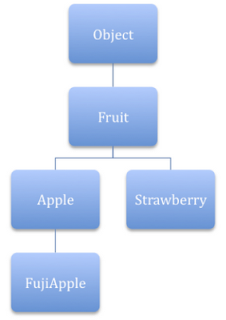 In the Fruit class hierarchy we’ve used so far, a function that accepts a Fruit as a parameter will accept any of its subtypes (such as Apple or Strawberry). As seen in the previous post, wildcards restore covariant and contravariant subtyping for generic types: using wildcards, then, let the developer write functions that can take advantage of the benefits presented so far. Since a List of whichever subtype of the class Fruit is a subtype of List<? extends Fruit>, the previous method will accept any such list as a parameter. Note that, as explained in the previous section, the Get and Put Principle (or the PECS Rule) will allow you to retrieve objects from such list and assign them to a Fruit reference. This way, a List of whichever supertype of Fruit could be passed in to the store function and you could safely put whichever Fruit subtype into it. It takes a collections of objects whose type is bounded: it must satisfy the T extends I<T> condition. Using bounded type variables may not seem more powerful than wildcards at first, but we’ll detail the differences in a moment. Juicy fruits will implement this interface and publish the squeeze method. This method accepts a list of objects whose type extends Juicy<? super T>, that is, in other words, that there must exist a type S such that T extends Juicy<S> and S super T.
Maybe you feel like relaxing the T extends Juicy<? super T> bound. This kind of bound is called recursive bound because the bound that the type T must satisfy depends on T. You can use recursive bounds when needed and also mix-and-match them with other kinds of bounds. Please remember that these examples are only given to illustrate what generics can do. Bounds you’re going to use always depend on the constraints you’re putting into your type hierarchy. This signature has pretty much equivalent to the previous one (since we’re only using T in the method arguments) but has got one slight advantage: since we’ve declared the generic type S, the method can return List<Juice<S> instead of List<? super T>, which can be useful in some situations, since the compiler will help you identify which type S is according to the method arguments you’ve passed. Since you’re returning a list, chances are you want your caller to be able to get something from it and, as you’ve learned in the previous part, you can only get Object instances from a list such as List<? super T>. An interface type followed by further interface types. A type variable may not be followed by other bounds. This is not always clear in the documentation I’ve read. A very good explanation; concise, and easy to understand. but, in that case, everything is consistent. If is correct, I’m missing something basic — please explain. good explanation with good examples. Thanks a lot Team..
What does this even mean? An interface called Juicy that has a method squeeze() that returns the interface Juciy ??? By using generics you can define an algorithm once, and you can apply it on any kind of datatype without any additional effort.